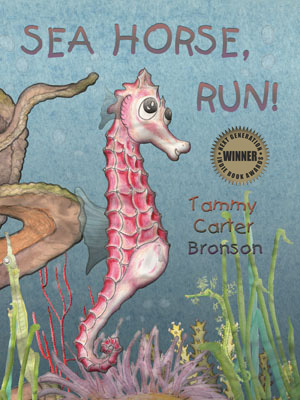 Tammy C. Bronson | Sea Horse, run! I can’t wait to watch the BBC documentary entitled ‘Great Barrier Reef.’ The latest ‘moralcoral’ post is awesome! 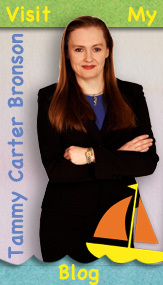 Be sure to check out her blog. For those of you who have been lucky to catch ‘Great Barrier Reef’ on BBC2 over the New Year, you will have been rewarded with breath-taking scenery and an insight in to the underwater world in high definition. However for some, the great continent of Australasia may seem very far away. So why should we be interested in coral reefs and what’s in it for us as a nation to protect them? Well coral reefs are actually a lot closer to home than you may think. 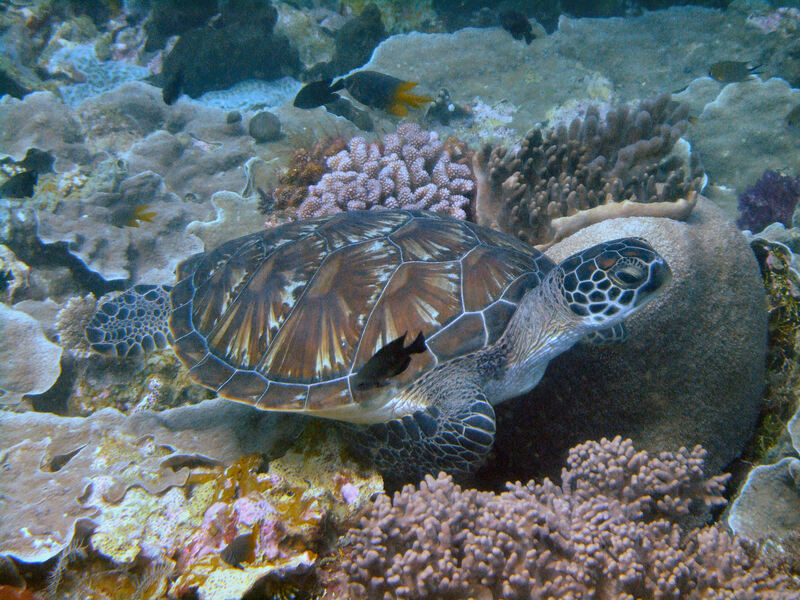 The world’s largest marine reserve, home to productive and pristine coral reefs, huge schools of fish, docile turtles and predatory sharks, actually lies within the British Indian Ocean Territory. Mrs. Daniel’s 4th grade class at Nolan Elementary in Signal Mountain, Tennessee gave me a wonderful set of pictures based on my books. 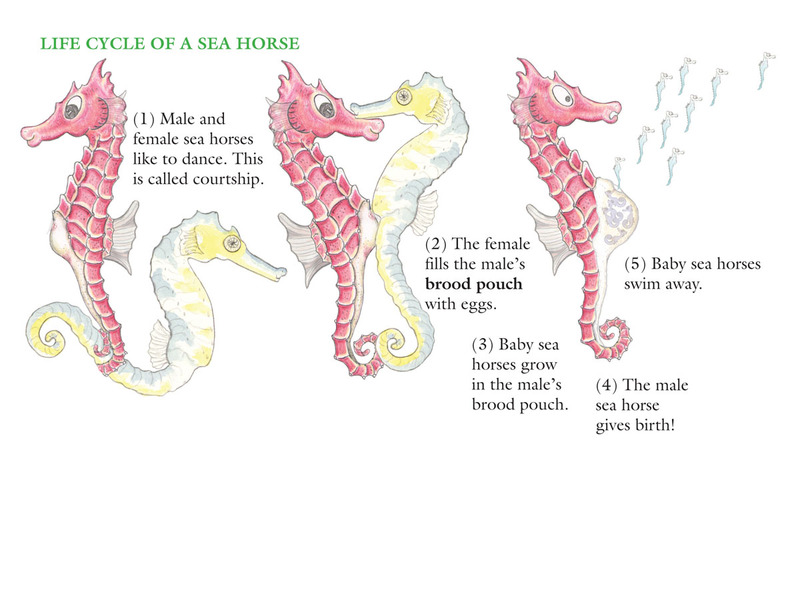 Here is a sample of their work from “Sea Horse, run!”. Jellyfish are a symbol for acceptance, so the appearance of jellyfish before the story even begins foreshadows or predicts that acceptance will be an important theme in the story. The poor Sea Dragon is misunderstood! Sea Horse learns to ignore gossip and accept Sea Dragon for who he really is. 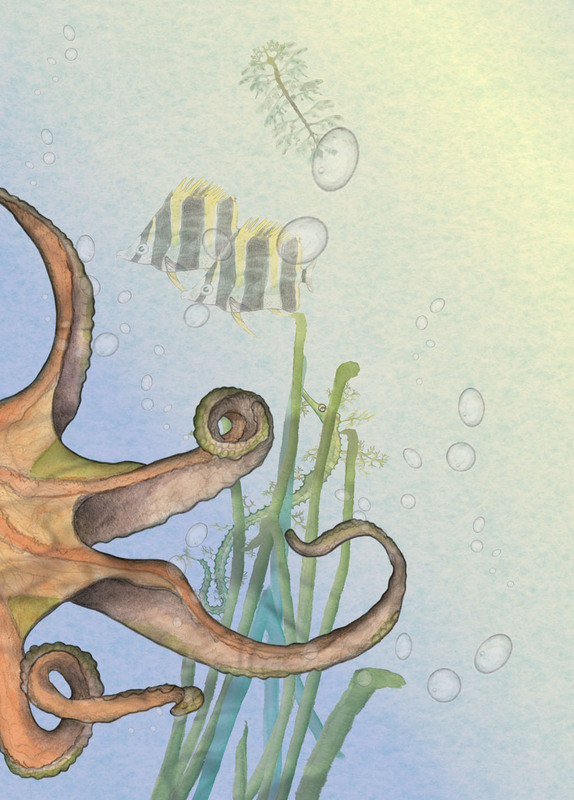 Nearly every picture book I’ve created has a snail hidden inside as a tribute to my first picture book, Tiny Snail. As I researched sea snails for “Sea Horse, run!” I had to include the Violet Snail (Janthina janthina) because it loves to surf. Art for pages 14 and 15 of "SEA HORSE, RUN!". Violet Snails are rather small. They only grow as large as 1.2 inches, but they like to live near the top of reefs so they can quickly hitch a ride with a wave. This amazing little snail surfs with bubbles. In fact, the Violet Snail can build a “raft” out of bubbles, and by clinging to his bubble raft, a Violet Snail can float to the surface of the water and travel for hundreds of miles from one reef to the next. Surely this makes the Violet Snail the most widely-traveled snail in the world. 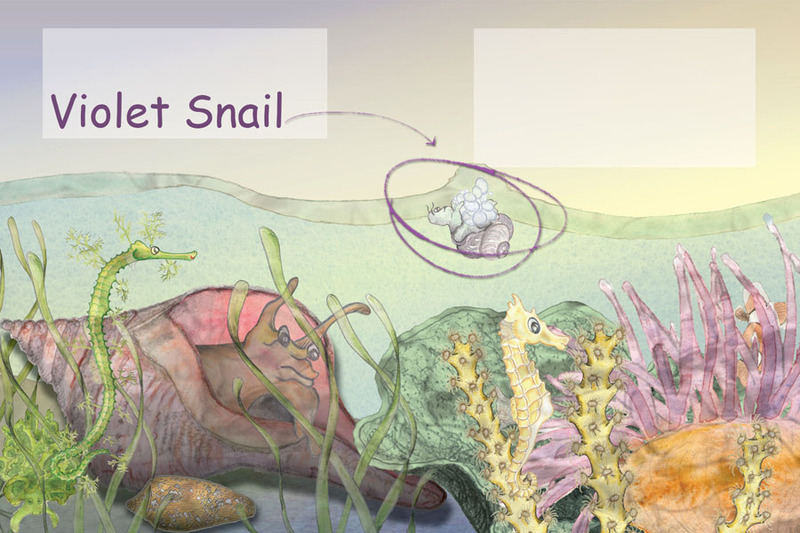 In “Sea Horse, run!” the Violet Snail is seen on page 15 hitching a ride a with a wave in order to flee the approaching Sea Dragon. Although the Violet Snail only appears on two pages in my book, he is making many appearances lately in the news due to some groundbreaking work by scientists. A team of researchers led by University of Michigan graduate student Celia Churchill reported their findings October 11th in the journal Current Biology. 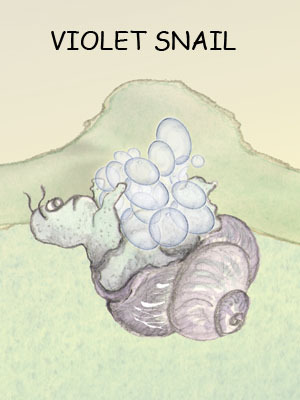 The Violet Snail is featured on the journal’s cover, and Celia Churchill says the bubble raft (which has the consistency of bubble wrap) is actually a modified version of an egg packet. My favorite article is “Snails Ship Out On Scrambled Eggs” at Science NOW online. Additional news with great photos is on-line at MSNBC News October 10, 2011. The same article (“Snails Sail Through Life on Mucus Bubbles”) is published at livescience.com. NPR did a 30 second news snippet this morning entitled: Biologists Solve Surfing Snails Mystery. 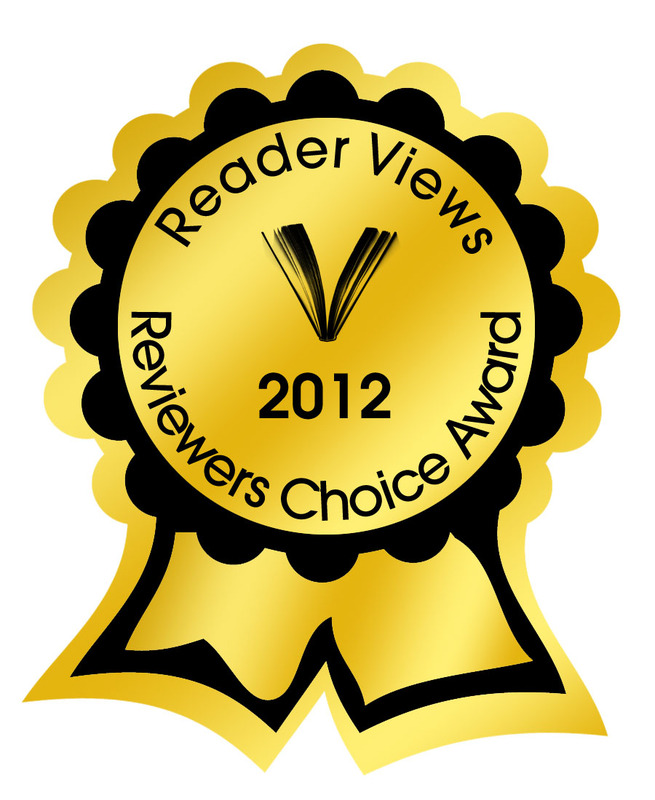 October 10, 2011 University of Michigan News Service: “In bubble-rafting snails, the eggs came first”. Even the UK’s Daily Mail picked up the article on October 11, 2011.